Should You Blot or Rub Carpet Stains? Accidents happen. As some point in its life, carpet stains are going to appear on your carpet. There is a proper way to spot treat carpet stains. Instinct may tell you to begin aggressively scrubbing and rubbing the stain until it feels as though your elbow is going to fall off. That’s actually the WORSE thing you could do. Blotting is the proper way to extract the liquid from the carpet fibers. Start by blotting the stain with a towel or paper towel. Once you extract as much of the stain as possible, you can begin rubbing the rest of the stain out. What you don’t want to do is initially start rubbing it because all you’re doing is spreading the stain in a broader area. As discussed in length on https://www.clotheslinecleaners.com/rug-carpet-cleaning-tips/, let’s go over some basic tips on how to quickly spot clean your carpet stains based on the type of stain that’s produced. Press down with the heel of your hand. Repeat using dry towels until all the liquid has been absorbed. For larger spills use a wet-dry vacuum to remove most of the material before blotting. Mix your own spot-cleaning solution by diluting a few drops of clear hand-dishwashing soap in water. Use no more than 1/4 teaspoon per quart. Don’t use laundry detergent because is too alkaline and may damage the rug or carpet. Don’t use creamy-looking hand-dishwashing soaps because they will likely leave a sticky residue. To remove colored spills or spot-cleaning solutions, such as soapy water or vinegar, either mist the area with clean water, or blot it with a wet towel. Then blot area with a dry towel. Repeat these two steps until no more residue can be removed. Do not rub, or the carpet fibers may become matted. Always start by picking up solids and blotting up liquids. Rinse and repeat 2-3 times before applying cleaning solution. Even some stains that seem extraordinarily difficult to remove (see below) can be repaired with these simple steps, so try this first and you may save yourself extra work. Stain Type: Organic – blood, berries, candy, chocolate, soft drinks/coffee, gravy, ice cream. Cleaning Solution: Buy 3% Hydrogen Peroxide solution at a drugstore and use full strength. Active Ingredient: Hydrogen Peroxide bleaches these stains without breaking down carpet dyes. Technique: Dab on hydrogen peroxide. Wait one hour and repeat as needed. Mud: Allow spill to dry and break off pieces and vacuum. Rinse with soapy water and apply hydrogen peroxide if necessary. Stain Type: Alkaline – animal urine, beer. Cleaning Solution: Combine 1 cup white vinegar with 1 cup water. Active Ingredient: White Vinegar, a mild acid, neutralizes alkaline spills. Technique: Apply vinegar solution with a spray bottle or a saturated towel. Blot with a dry towel; rinse. If stain persists, repeat. 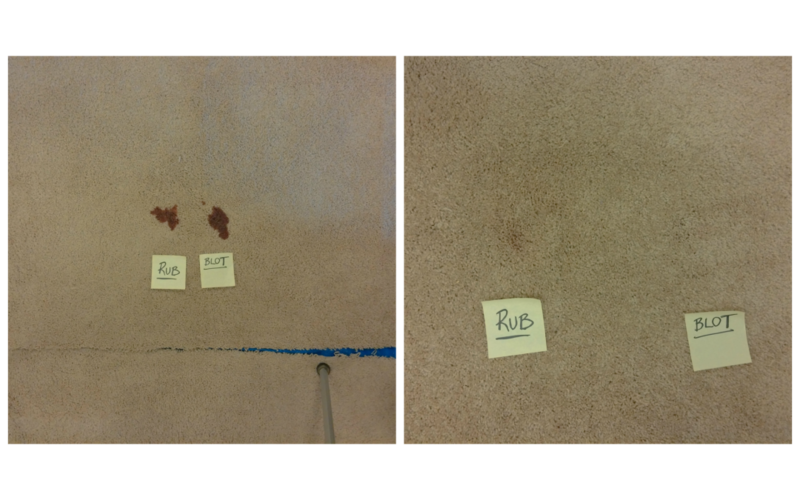 Stain Type: Acidic – ketchup, cough syrup, mixed drinks, soy sauce, watercolor paint. Cleaning Solution: Combine 1 tablespoon with 1/2 cup water. Active Ingredient: Ammonia, an alkali, neutralizes acidic spills. *Note: Never use on wool; it can destroy the fibers. Instead, dilute spill with plain water. Technique: Blot up liquid spills. Scrape off solids with a spoon or knife. Apply ammonia solution with a spray bottle or a saturated towel. Blot out excess with dry towel. Rinse. If stain persists past the initial cleanings, use soapy water, rinse and repeat until improvement stops. If stain persists, use hydrogen peroxide and use the same instructions as above. *Caution: Ammonia is toxic so be sure to use good ventilation. Stain Type: Oily/Waxy – asphalt and tar, wax and crayon, metal polish, grease, hand lotion, ballpoint ink, makeup. Cleaning Solution: Use full strength Rubbing Alcohol directly from bottle, but do not let it puddle as it may destroy the rug or carpet backing. Active Ingredient: Rubbing Alcohol dissolves oily or waxy material. Technique: For wax, cover area with a brown paper towel, and transfer the wax by ironing on warm. Apply rubbing alcohol with a towel or cotton ball. For deep stains, blot with a clean towel, and repeat until towel remains clean. If spill is on the carpet tips, work material out by gently rubbing in one direction rather than blotting, which might drive the stain deeper. If stain persists, blot with soapy water and rinse; repeat. If needed, switch to hydrogen peroxide, as detailed above. Cleaning Solution: Remove these items from contact with fabrics immediately, or as soon as possible. Unfortunately, there is no solution for stains of this type that have set into fabrics. You may attempt cleaning, however the stain is likely permanent. *Note: For wall-to-wall carpet, call a professional to cut out the damaged area and patch with carpet from a closet or other hidden area. Alternatively, move furniture or set out pillows to cover stain. With area rugs, rotate so stain is in a less noticeable position.